It’s maple season! 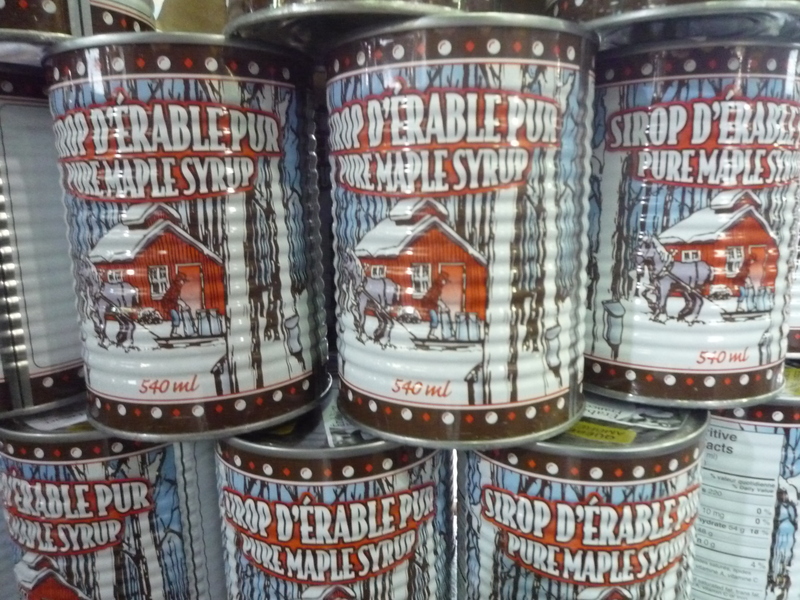 March and April are the peak times for maple syrup production in eastern Canada and the northeastern United States. Warm days + cool nights = excellent sap flow. It’s a time consuming and laborious process: it takes about 40 gallons of sap to make just one gallon of syrup. However, the results are well worth it and there are countless delicious recipes that showcase this beautiful sweet elixir. 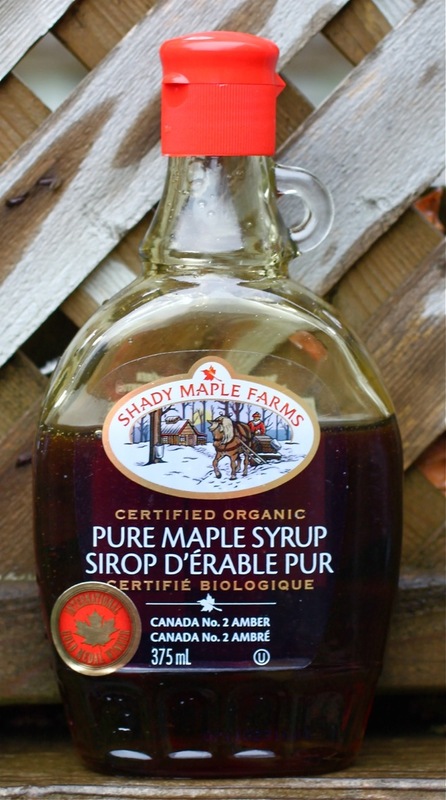 I enjoy maple syrup in many forms: as a topping for pancakes and french toast, cooked into desserts and occasionally in savoury dishes. Savoury dishes (ie. not desserts) are a less common way to use maple but the results are just as delicious. This Asian-inspired sauce is absolutely fantastic on chicken and pork. Note that the sauce is quite sweet so it should be brushed onto the meat in the last few minutes of cooking or it will burn to a crisp. Most ingredients should be readily available at supermarkets but if you can’t find shao hsing rice wine (a.k.a. shaoxing or Chinese rice wine), you can substitute dry sherry or gin (or just leave it out). Chinese five spice powder can be made from common spices can’t find it already blended. For more great maple ideas, check out the Maple Archives. In a medium saucepan, add the oil and heat on medium-high. Add the garlic, ginger and green onion and reduce the heat to medium. Sauté until softened, stirring constantly to prevent burning, about two minutes. 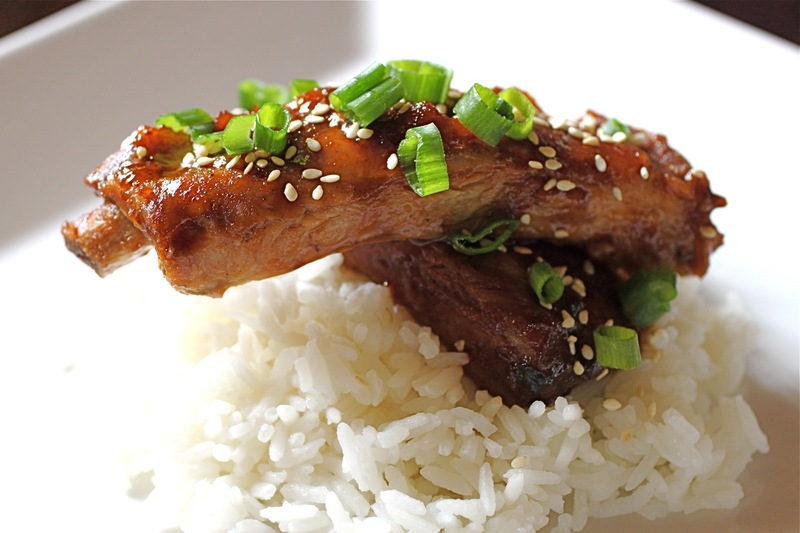 Pour in the soy sauce, hoisin, maple syrup, ketchup, sesame oil, rice wine and white vinegar. Stir until smooth. Add the Chinese five spice powder and stir to combine. Simmer the sauce on medium-low heat until it begins to thicken, about 15 minutes. Stir occasionally. Remove the sauce from the heat and let cool a bit. Strain the sauce to remove the ginger and onion chunks, if desired. Brush sauce onto grilled, baked or roasted meats in the last 10 minutes of cooking. Sauce can be kept covered in the fridge for a few days. Garnish the finished dish with toasted sesame seeds and chopped green onion tops. Suggestions: The sauce is delicious on pork, chicken, beef, shrimp and firm tofu. 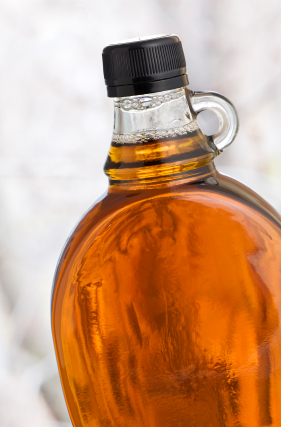 Maple syrup is one of the great treats of spring. The sap in maple trees begins to flow when the temperature climbs above freezing during the day but the nights remain cool. 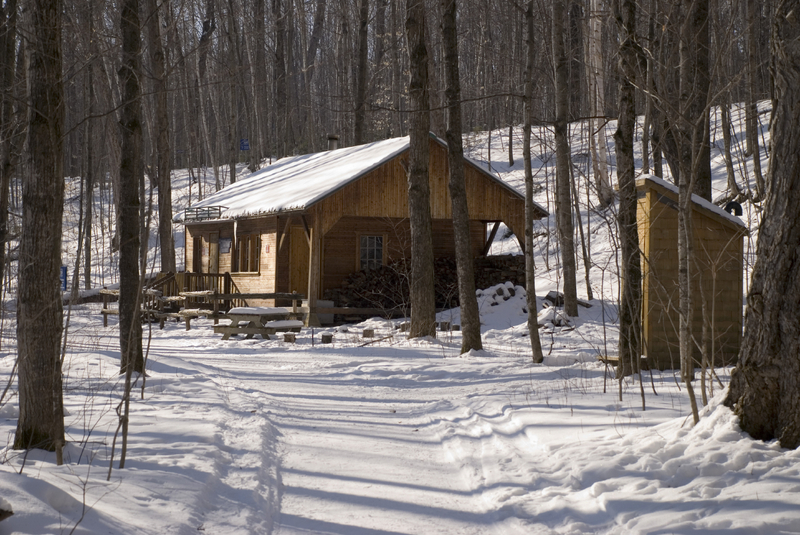 By March, conditions are ideal and a trip to a sugar shack (known as a cabane à sucre in Quebec) is a great activity for the whole family. I remember visiting sugar shacks as a kid and loved the sweet, smoky smell of the boilers cooking down the maple sap, turning it into the golden elixir we pour on our pancakes. There were always maple treats that went beyond bottle syrup such as maple taffy poured onto the snow, maple butter, maple candies and maple sugar. Many sugar shacks also offer hearty, rustic meals of pancakes, pork and baked beans to showcase their syrup. Each spring, Martin Picard, chef and owner of the famed Montreal restaurant Au Pied de Cochon, opens a version of a cabane à sucre featuring his unique take on the Quebec maple experience. Cabane à Sucre Au Pied de Cochon is located about 45 minutes from Montreal in St-Benoît de Mirabel. However, reservations can be hard to come by (this season is fully booked) so plan ahead if you want to go next year. I haven’t been to the cabane à sucre yet (hopefully next year!) but if it’s anything like Au Pied de Cochon, you’re in for a treat, especially if you enjoy foie gras. Spicy Maple-Dijon Glaze – Brush on ham, bacon or a pork roast or use as a dip or spread for sandwiches. Maple-Caramel Custards with Sea Salt – This rich and creamy custard is the perfect way to end a meal. Pumpkin French Toast – A breakfast treat with the flavours of pumpkin pie. Top it off with a healthy drizzle of real maple syrup. Pancakes – Skip the accompanying blueberry sauce in favour of some maple syrup. Pumpkin Pie with Maple-Walnut Praline – A classic pie with a delicious and decorative twist. Baked French Toast – Breakfast is made easy with a dish that is prepped the night before and baked in the morning. Maple Nut Oatmeal – Warm up on cold mornings with a sweet and nutty treat. 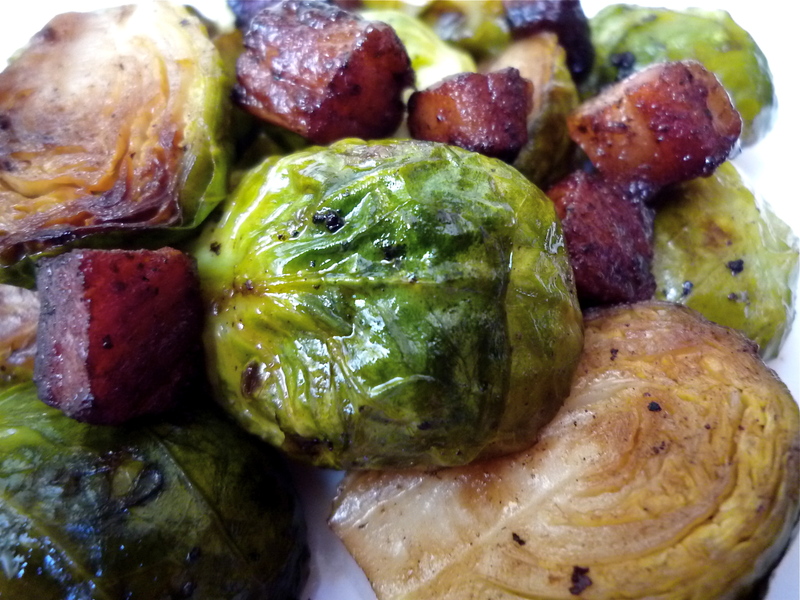 Brussels Sprouts with Bacon and Maple – Dress up dreaded brussels sprouts with a maple based glaze that brings out the best in this underrated vegetable. 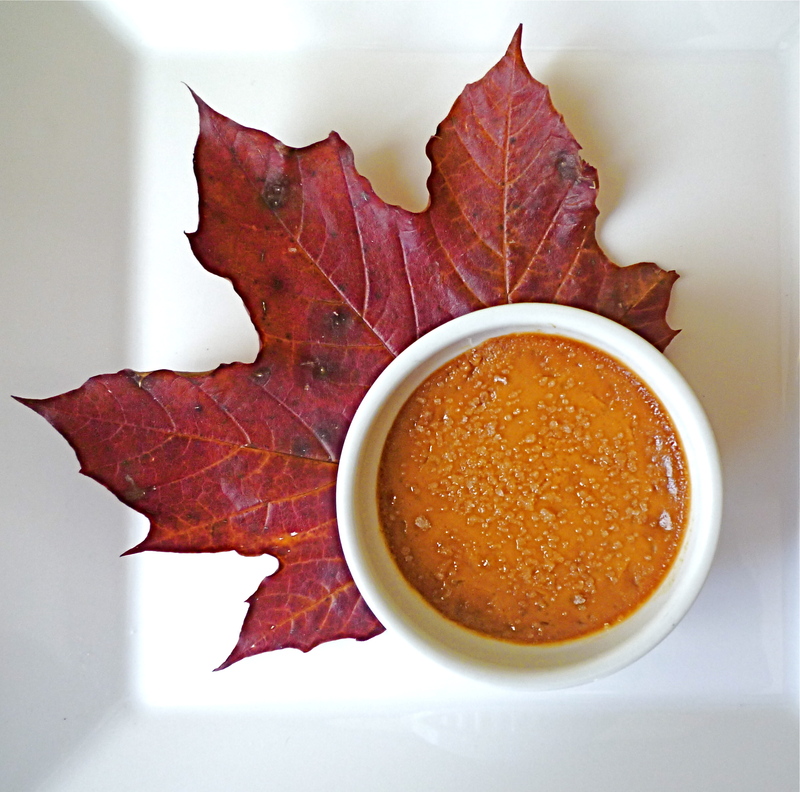 Maple-Caramel Custard with Sea Salt, plated on a maple leaf. Like most people, I love chocolate desserts. However, sometimes I’m craving something a little different and caramel fits the bill perfectly, Maple syrup goes well with the caramel, making the flavour even deeper and richer. A sprinkling of sea salt to finish adds a bit of crunch and further enhances the caramel. It sounds a little strange but trust me, it’s good! I have been intimidated by custard in the past, after a bad experience with hollandaise sauce that turned into a clumpy, scrambled egg mess. However, if you take your time and follow the instructions carefully, you shouldn’t have any problems. The key is to add the hot cream slowly to the egg yolks, whisk constantly and strain the final custard to get rid of any stray lumps. Cooking the custards in a water bath will ensure they don’t scorch in the oven. To plate the desserts: If you’re in the north and happen to live anywhere near trees, there are probably a million leaves on the ground right now. Maple leaves have a beautiful shape and colour so I collected a few from my yard to dress up the plate a bit when serving the custards. They’re thematically appropriate and cost nothing so you can’t go wrong! This dessert has two complicated sounding components – making the caramel and preparing the custard. However, it’s not difficult if you take it step-by-step. Placing a dishtowel at the bottom of the water bath will keep the ramekins from slipping around and spilling on their way in and out of the oven. In a large bowl, add egg yolks, brown sugar, vanilla extract and a pinch of salt. Whisk together until smooth. Set aside. To make the caramel: In a large saucepan, add 1/2 cup white sugar and 1/4 cup water. Heat on medium-high. The sugar will dissolve and the mixture will begin to bubble within a couple of minutes. Occasionally lift the pot off the burner and carefully swirl the mixture but do not stir it with a spoon. Cook sugar mixture until it begins to brown- about 7 to 8 minutes. Once it starts to turn golden it will darken VERY quickly so do not leave it unattended! Continue cooking for another minute or two, until the caramel is about the same colour as the maple syrup (a medium-dark amber colour) and remove the pot from the burner. Carefully add the butter and maple syrup. It will bubble up a bit as the ingredients are added so use caution. Stir mixture and return to the burner on medium-low heat. Slowly whisk the whipping cream and milk into the caramel. Remove the caramel mixture from the heat and let cool slightly for about 1 minute. Very slowly pour the caramel/cream mixture into the bowl with the egg yolks, whisking constantly (you may want to have someone help pour the caramel if the pot is heavy). Strain the custard through a fine sieve into a large glass measuring cup or other heat-proof vessel that you can easily pour from (such as a pitcher). Prepare the ramekins: In the bottom of a large roasting pan, place a folded dishtowel and smooth it out so the ramekins can sit evenly. Place the ramekins on the dishtowel and fill each one with the custard mixture. Use a large pitcher to carefully pour water into the roasting pan, being careful not to get water in the custards. Fill about 2/3 of the way up the outside of the ramekins. Make sure the dishtowel is completely submerged in the water so it doesn’t burn in the oven. Bake the custards for 45 to 50 minutes or until they are set in the middle. Let cool and refrigerate for at least 2 hours. Sprinkle with sea salt just before serving or place a small dish of salt on the table so diners can add their own. Garnish the plates with maple leaves for a fun presentation if desired. When it comes to breakfast a lot of people just eat the same thing every morning: maybe some cereal or toast, a piece of fruit or an egg and some coffee. 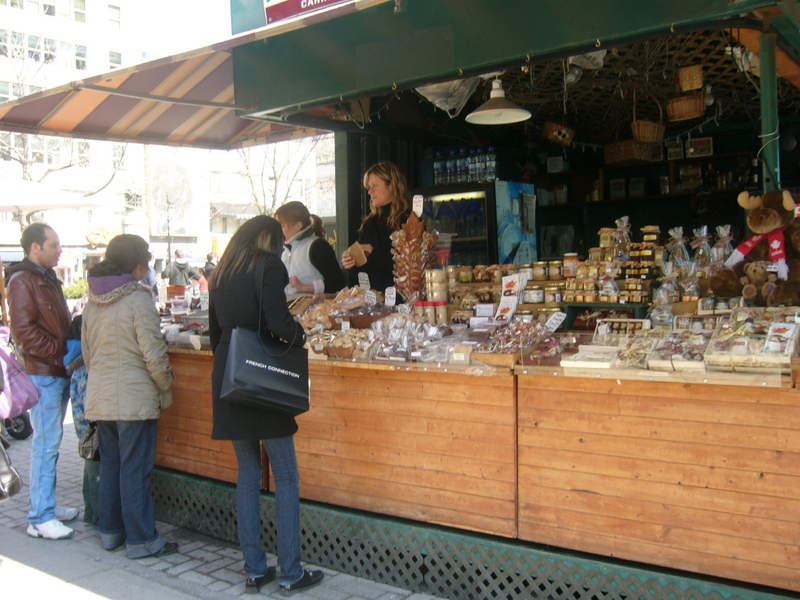 However, breakfasts can be seasonal meals, reflecting the weather and what’s available at the markets. In the summer, an omelette with fresh herbs and tomatoes served outdoors hits the mark while in winter we might prefer something a bit heartier on cold mornings. This morning it is -22 degrees Celsius here so clearly something warming is in order. A bowl of hearty oatmeal with toasted nuts and a hint of maple fits the bill perfectly. By using quick cooking oatmeal, you can have breakfast on the table in minutes without a lot of fuss. While oatmeal is often sold in single-serve, flavoured packets, I prefer to add my own seasonings. 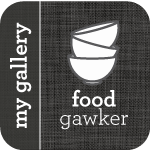 It allows you to control the ingredients so you’re not eating a lot of weird additives and you can sweeten it to your taste (it’s much more economical as well!). You can adjust the maple syrup in this recipe depending on how sweet you prefer your oatmeal. In a saucepan, add oats, water, salt, brown sugar, nuts and 1 teaspoon maple syrup. Stir to combine. Bring mixture to a boil and cover. Turn heat to low and let simmer for 5 minutes. Remove from heat, stir and drizzle remaining 1 teaspoon of maple syrup over oatmeal. 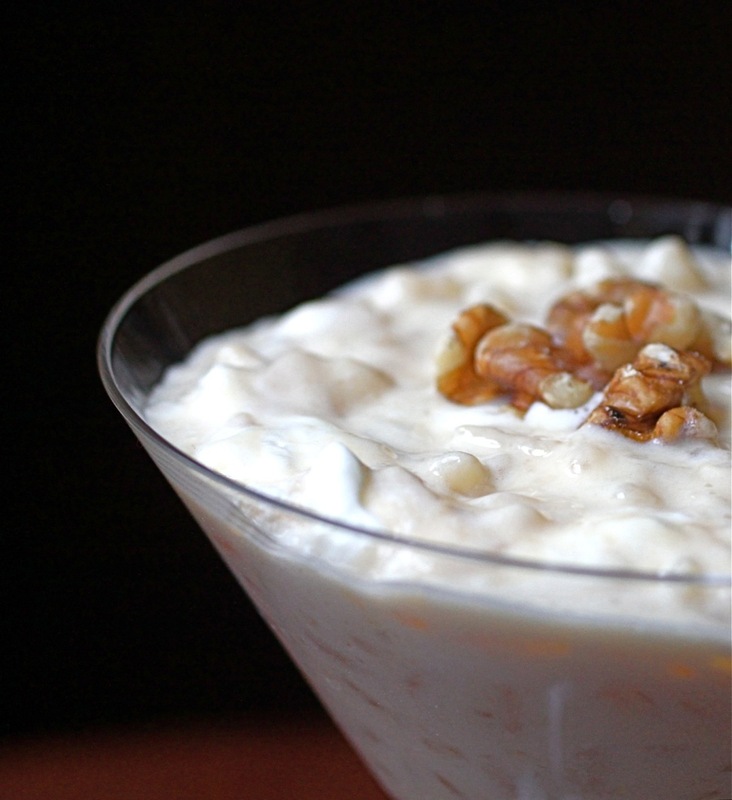 Garnish with whole nuts and serve. When cooking for a crowd around the holidays, it’s helpful to have a few recipes that can be prepared in advance so you can enjoy the festivities with your guests. This is the perfect dish for Christmas morning or New Year’s Day but it can be made any time you want something fuss-free and delicious for breakfast. All the prep work is done the night before so all you have to do is bake it and serve in the morning. This recipe was developed by me and my sister-in-law Jenn this year so we could minimize kitchen time on Christmas morning. It works best with bread that is slightly stale. Use a whole loaf (instead of pre-sliced bread) so you can slice it thickly yourself. Grease a large baking pan (at least 12″ X 16″). Slice bread into slices about 1″ thick and lay flat in pan. Make sure all pieces are laying flat and not overlapping or they won’t brown properly. In a mixing bowl, combine evaporated milk, eggs, maple syrup, vanilla, orange zest, nutmeg and salt. Whisk until smooth and thoroughly mixed. Pour mixture evenly over bread slices. Once it has soaked in a bit, turn slices over so they are completely soaked in egg mixture. Cover pan and place in the fridge overnight. To bake: heat oven to 425 degrees Fahrenheit. Bake french toast for 20 to 25 minutes or until the bread is browned on top and beginning to puff. Serve with maple syrup or your favourite topping.